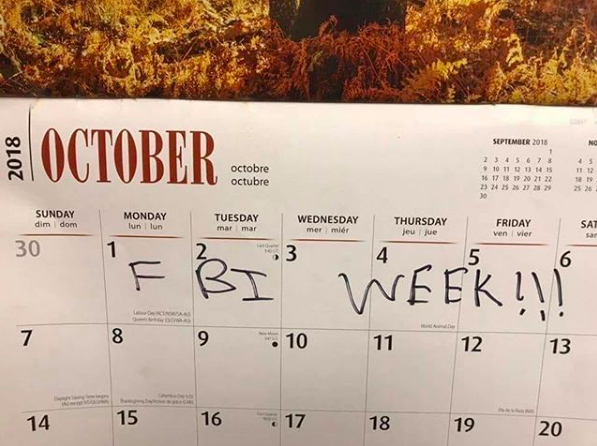 It’s Day 1 of “FBI Week”, y’all! OK, so to make a long story short: Last week, Donald Trump’s Supreme Court nominee Brett Kavanaugh testified before the Senate Judiciary committee in what will likely go down in history as the most bizarre and incendiary judicial interview process in history. Republicans were desperate to avoid getting the FBI involved. But after Kavanaugh’s temper tantrums, talk about wasting, boofing, and MMF threesomes, Lindsay Graham’s dramatic Scarlett O’Hara-esque outburst, and Chuck Grassley’s inability to keep anything in control, it was finally decided that, OK, OK maybe this whole thing has gotten out of hand and the FBI should do an investigation after all. Republicans have begrudgingly granted the FBI one whole week to conduct thorough investigation into Kavanaugh’s past behavior, his alleged sexual assaults against Christine Blasey Ford and Deborah Ramirez, and whether he maybe lied under oath during his senate testimony. Now we get to wait and see what they learn. #lindseygraham #republicans #theoscars #politics #politicalmemes #republicanos #judgeCavanaugh #tobycavanaugh #cavanaugh #ussupremecourt #lol #lmao #megusta #dalelike #likeforlikes #memes #meme ? ? ? Sad but true, right? All you homocons who voted for Orangeturd ought to be pleased. The last one with Obama is the best. No known perjurers, political operatives, drunks and suspected gang rapists for lifetime appointments on the Supreme Court. Interesting that he tried to bring out his wife and yet she seemed terrified the entire time. I wouldn’t be surprised if she ends up writing a tell all in the future. Good photos! I laughed my fanny off!